A primary responsibility of a water quality engineer is to supply potable and palatable drinking water to a community. Water Treatment covers the gamut of operations that are required to convert a raw water source—whether surface water or groundwater—to a quality that conforms to all federal, state, and local environmental standards for drinking water. This book includes basic chemistry principles that are indispensable to a fundamental understanding of water treatment operations. The goal is to enable the reader to quickly find all the information—without any need for multiple sources—required to clearly understand concepts that are integral to water treatment. 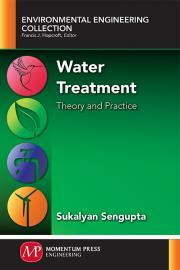 Numerous solved examples throughout the book facilitate a step-by-step approach to any water treatment process. Sukalyan Sengupta is a professor of environmental engineering in the civil and environmental engineering department at the University of Massachusetts Dartmouth. A registered professional engineer in Massachusetts, he has more than 20 years of academic and research experience in environmental engineering treatment processes. He is the section editor (Water Pollution) of Current Pollution Reports, a Springer publication that provides in-depth review articles contributed by international experts on the most signifi cant developments in the fi eld.